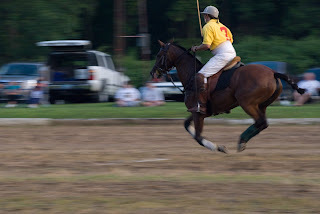 This image is from the polo match and is an attempt at panning to obtain a motion blur for the background and the subject in focus. Overall, the background needs more panning blur and more of the rider's polo stick should be in the image. The shutter speed was 1/60 of a second. I experimented with 1/60 and 1/125 of a second for different looks. Possibly, if I would have panned at a different speed the background would blur more. Maybe next time.